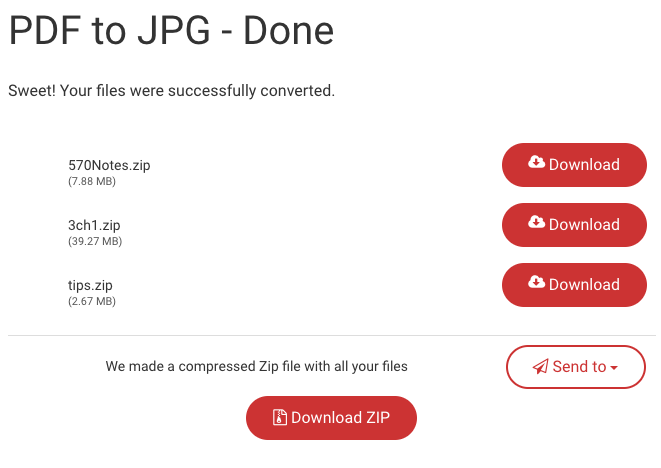 How to convert PDF to JPG images ? The PDF to JPG tool enables converting PDF files to JPG images or extracting all images from a PDF file. Drag files into the browser for example from your Desktop, or Windows Explorer or Finder on Mac. Click "Browse" to open a file picker and select files from your computer. You can select multiple files at once. Upload files from Google Drive or Dropbox by clicking on their respective icon in the upload area. You will need to authenticate with the corresponding cloud service and then select the files from the interface that pops up. Select the extraction options. You can choose between having each page rendered as a separate JPG image or extract all images from the PDF into separate files. 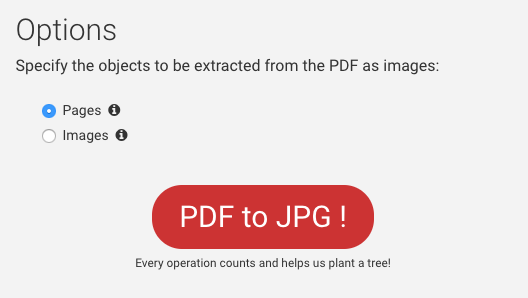 Click the "PDF to JPG" button to go ahead and perform the conversion. You will then be redirected to the download page where you can download the converted image files once it has been processed. The images are delivered as ZIP archives where all the images are contained in each file. The file names refer to the original file name (origfile.zip). Simply click on Download to download each file. Note that you need to be logged in with an account to be able to download files. If you do not have an account, you can sign up for one and download your file right away. Once you are done, you can click "PDF Tools" to navigate to other PDF tools, or to go back to protect another file, simply click the PDF to JPG link. If there was something wrong and you want to try different options, you can use the "Do over" button. It brings you back to PDF to JPG but keeps all the uploaded files in tact, so you can change the restrictions without starting from scratch.